Somehow, it became commonly accepted that half of all marriages end in divorce. This quote permeates American culture and perspectives on divorce coloring thought process and opinion. While the various measures of divorce occurrence lead to distinct facts and figures, the numbers are no help. Knowing the math of the matter doesn’t make divorce any easier, but knowing the truth will. With that in mind we gathered up five of the most commonly held beliefs about divorce-fact and fiction- as you enter what is considered to be one of the most stressful experiences of life. There are dozens of different methods to calculate the national divorce rate. No matter what source you check, the United States does not have the highest divorce rate. The United Nations published a study listing the top 10 countries with the highest incidence of divorce. Russia took the top slot with Belarus taking 2nd place and Ukraine rounding out the top three. The US came in at #6. Not necessarily a cause for celebration, but hardly “the worst?” making this myth very much FALSE. According to Guinness World Records, crown for highest divorce rate is held by the island nation the Republic of Maldives. Maldives, a series of 26 atolls located in the Indian Ocean, boasts fewer than 11 divorces per 1,000 inhabitants each year, almost three times the number in the United States which clocks in with 4.34. The US still ranks 3rd overall with Belarus taking the 2nd spot according to Guinness. TV writers often use annulment as an plot-escape for a fictional character’s zany Vegas wedding so that everything can go back to normal in the next episode. Like most things on TV, annulment’s not that simple. The length of time a couple has been married holds no bearing on their eligibility for annulment. Annulments are only granted under very specific circumstances when it can be proven that a marriage is void or that one spouse misled the other prior to marriage. 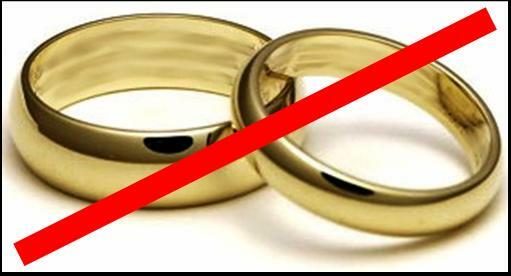 If for example one spouse is currently already married, the second marriage is void and can be annulled. The same’s true if spouses discover they are closely related. Material facts qualifying for annulment include things like one spouse not being the physical gender he or she claimed to be at the time of marriage. A couple who has only been married a short time will require divorce unless they can prove one of the previously mentioned criteria and a couple married for decades may qualify for annulment if they find any of the above to be true. Ultimately, time is not a factor for divorce and this myth is FALSE. Alimony is money (either a lump sum or payments over time) from one former spouse to the other agreed on at the time of divorce. The intent of alimony is to provide either partner continued access to the lifestyle he/she became accustom to during the marriage. The widespread belief that all ex-wives are entitled to alimony comes from the antiquated idea that men are sole breadwinners and women are financially dependent on their husbands. The truth is most women do not receive alimony. Whether or not a woman worked during marriage, her entitlement to alimony is based on her skill set and physical ability to earn a living. Vocational experts are often brought in to determine what a woman’s potential salary could be based on age, education, experience, etc. and alimony allocations are made from these findings. Not all divorces end in alimony settlements. Length is a major determining factor. The shorter the term of marriage, the less likely it is that either spouse became financially dependent on the other and therefore is entitled to alimony. Financial dependence can be tough to prove and this myth is FALSE. Division of assets, or the splitting up of shared property, is a major aspect of divorce proceedings. Houses, rental property, retirement and pension plans, stocks, art, and everything else is assigned value and split between divorcing parties. Most gifts between spouses are considered marital property and therefore are split during divorce with the exception of engagement and wedding bands (or other engagement/wedding presents between engaged individuals). Because these are technically exchanged prior to marriage and therefore prior to the legal joining of assets, the recipient is considered the sole owner. Courts have continually ruled that engagement rings belong to the bride making this myth TRUE. Regardless of whether or not the mother is the primary caregiver during the marriage, both parents are legally entitled to equal time. There are caveats to this including creating an environment where the child can be successful and not having to go from one house to another every other day. The best interest of the child extends to safety and well-being. If a mother does not meet a state’s standards to be deemed a “fit parent” she will not be given primary custody. Should both parents be considered fit to raise children they typically share custody. Societal prejudice aside, this myth is FALSE. There you have it- 5 divorce delusions debunked (or verified in the case of the engagement right.) Hopefully this list helped clarify some of the many misconceptions about divorce racing through your head. While your family and friends may have lots of opinions, ideas and beliefs about divorce-editorial or practical-the truth is divorce is a legal matter. While we can’t answer all your questions in a few short paragraphs, our team is here to protect your interests and assist with the difficult process. If divorce is on your mind, give us a call at 856-227-7888 for a free consult to discuss your legal options. We’re also on Facebook!